Haarlem, Delft, Leiden, Utrecht, Dordrecht, Amsterdam Schools. During the era of Baroque art, the United Provinces, of which Holland was one, occupied the northern part of the Low Countries. Less developed than Flanders, perhaps they had once been the poor relations of the Flemings, but in the seventeenth century the nation was rich, proud, and expanding in influence. In fact it became one of the wealthiest nations in 17th century Europe. It was also addicted to painting: during the period 1600-80, more than 4 million paintings were produced in Holland - far more than the number produced by artists of the Flemish Baroque - and every sort of person indulged their own appreciation of fine art painting; artisans, merchants, burghers, sailors, shop-keepers - all knew, or prided themselves on knowing, something about it. The sort of Baroque painting they admired and which they commissioned from their artists were however different from Italian paintings, different even from those of Rubens. The Dutch, being Protestants, had banished Catholic-style Christian art, which was still the main form of painting in Catholic countries. Once they had gained their independence, they expressed their contentment in the enjoyment of the good things of life: fine, solid houses, convivial company, clothes of high quality. They were, in short, bourgeois, and they wanted pictures that reflected the contentment of bourgeois prosperity: portraits, interiors, genre-paintings (scenes of everyday life) and affluent looking still lifes, painted on canvases of moderate size, to hang in ordinary houses. This was the beginning of the Dutch Golden Age (c.1610-80), during which the school of Dutch Realism established itself as one of the greatest ever movements of oil painting in the history of art. The best Baroque paintings by its leading members - such as Rembrandt and Vermeer - represent the summit of human creative achievement and command multi-million dollar prices at auction. The school also set standards in the categories of naturalism, still life and genre painting, which have hardly been equalled, far less exceeded. Frans Hals (1580-1666) was the first great exponent of portrait art of the Dutch Baroque school: the first to shake off the dominant Italian classical approach to portraiture, in favour of a more realistic style. A style in which his sharp eye for observation and lively power of expression could conjure up a suitably unique composition. Hals painted what his customers wanted, and in prosperous, bourgeois Holland, the new middle class patron wanted above all to see himself in oils. Portraiture was after all the photography of the day, except better, because a painter can flatter the sitter better than any camera. It was this genre that Hals mastered. In his brimming vitality, for all his poverty and debt, he could always console himself by painting the portrait of a jolly fool - capturing the sitter not in the brilliance of a finished portrait, such as Rubens had taught people to expect, but by a new picturesque improvisation, owing its charm to its easy, loose, brushwork - a style appreciated above all by the 19th century Impressionists. Where Hals specialised in capturing the unique exterior of a subject, Rembrandt (1606-69) looked for the inner reality. To put it another way, while the Flemish Baroque painter Rubens personified the exuberant, theatrical, courtly side of Baroque art, Rembrandt represented its tormented, dramatic, introverted aspect. He was the heir to Caravaggio; and he made this inheritance the nucleus of an incomparable achievement. It was Rembrandt who gave a new spirituality to the realistic art of Holland. He kept the methods of realism, but gave them a hitherto unknown, translucent luminosity. Above all, he went below the surface of his human subjects and exposed some of their inner character and soul beneath. One of his first great portrait masterpieces was actually a group portrait, a type which was especially characteristic of the country and the time. During the wars with Spain, many companies of volunteer soldiers had been formed - we should perhaps call them militia companies. After the Dutch victory their members had not gone their separate ways but continued to meet; and each of these companies wanted a group portrait to show their members gathered together. Usually these canvases were of greater width than height, and showed the officers of the company grouped around a table or some other object that would serve as a pretext for a gathering of so many men. The lighting was depicted as natural, without any dramatic contrast, giving the same emphasis to each of the subjects. Rembrandt's portrait - highly controversial at the time - is actually entitled The Company of Frans Banning Cocq and Willem van Ruytenburch but is more commonly known as The Night Watch (1642), because of the dark background from which its figures emerge, partially or wholly illuminated by patches of light. But it is not a night scene: the darkness is a technique of caravaggism known as tenebrism, involving the contrast of dark shadow with areas of strong light - a technique which had not been seen before in group portraiture. Contrary to convention, the militia officers do not all have the same importance but are presented in strictly hierarchical order. The captain of the company and his lieutenant are seen in strong light in the centre with the others around them, only their heads emerging from the shadow. Such an approach signified the beginning of an interest in the use of light to observe a single figure, or sometimes only a face. To see how conventional Dutch painters approached this type of group portraiture, see Company of Captain Reinier Reael (Meagre Company) (1637) by Frans Hals. Caravaggesque methods are also evident in Rembrandt's single portraits, in which the shadows can be even darker and invade almost the entire canvas. The light falls from one side of the subject, illuminates the face, dramatizes every wrinkle. Sometimes it also strikes a secondary subject - a book, a table, or other object. The rest is an area of darkness whose purpose is to throw into relief those parts that are minutely scrutinized. Good examples include: The Conspiracy of Claudius Civilis (1661) Nationalmuseum, Stockholm); Bathsheba Holding King David's Letter (1654, Louvre), and the poignant Suicide of Lucretia (1666, Minneapolis Institute of Arts), along with many of Rembrandt's self portraits. To cater for the rising demand among the bourgeoisie for easel art, notably genre painting, a number of artistic movements sprang up in towns like Haarlem, Delft, Leiden, Utrecht, Dordrecht and Amsterdam. Thus was born the Dutch Realist style of genre painting which is still seen as the apogee of the idiom. The Haarlem school was represented by Adriaen van Ostade (1610-85) (lowlife peasant scenes), and the Catholic Jan Steen (1626-79) (moralising tavern scenes); while Pieter de Hooch (1629-83) and the incomparable Jan Vermeer (1632-75), represented the Delft school. Utrecht had Hendrik Terbrugghen (1588-1629), and Gerrit van Honthorst (1590-1656), both strongly influenced by Caravaggio, while the Leiden school's most famous member was Rembrandt's first pupil Gerrit Dou (1613-75), known for his small, colourful, polished works. The Dordrecht school was represented by the "interiors" painter Samuel van Hoogstraten (1627-78) and Nicolaes Maes (1634-93), noted for his kitch genre-paintings and chiaroscuro effect; while the Amsterdam school consisted of Rembrandt, his pupils Govaert Flinck (1615-60), Ferdinand Bol (1616-80), and the talented Carel Fabritius (1622-54) who perished in a gunpowder explosion, as well as Gerard Terborch (1617-81), and Gabriel Metsu (1629-67), noted for his intimate small-scale genre works. Special mention should be made of Jan Vermeer of Delft, who in his only self-portrait, if it is really anything of the kind, symbolically turns his back on the observer, as if to remain completely concealed within his world. Only from his portraits of elegant women do we realize how little is known of him - the poverty-stricken father of eleven children - who hardly ever left his native city, where he ate his heart out in longing for the aristocratic life; who languished in obscurity for centuries before being acclaimed as one of the all time greats of 17th century Dutch painting, on a par with the majestic Rembrandt. It was in the Baroque period too that a type of picture was developed that was to remain successful up to our own time - the 'still life painting', a picture offering an arrangement of flowers, of more or less inanimate objects of one kind or another, generally painted in the studio, that is to say indoors. Of course paintings of this kind had certainly been made earlier, but now they constituted a true genre, with practitioners in every country and in every school of painting. Again the innovator who had founded this kind of painting was Caravaggio, who indeed began his artistic career in this type of work. Not unnaturally, however, the genre reached its highest development in the Netherlands, where there was already a precursor, if not a tradition, of realistic, domestic, straightforward painting carefully attentive to the detail of everyday life, which had been produced there from as early as the fifteenth century. NOTE: Dutch painters developed a particular genre of still life art - known as vanitas painting - which contained moralistic (Biblical) messages. The tradition of still life art was developed by a number of exceptional painters who included: Willem Claesz Heda (1594-1680) and Pieter Claesz (1597-1660) both members of the Haarlem school; Jan Davidsz de Heem (1606-84) of the Utrecht school; Willem Kalf (1619-93) the Amsterdam painter of pronkstilleven paintings; and Rachel Ruysch (1664-1750) the Amsterdam flower painter, arguably the greatest still life artist of the Late Baroque. Coinciding with the classical Arcadian landscapes of Claude Lorrain and Nicolas Poussin, working in Rome, the Dutch school began to produce great examples of Baroque landscape painting, of which the finest works were created by Jacob van Ruisdael (c.1628-82) and his pupil Meindert Hobbema (1638-1703); other top artists included Philips de Koninck (1619-88) who specialized in large-size panoramic views; and Aelbert Cuyp (1620-91) noted for his soft light and impastoed highlights. Other Baroque landscape painters included: Hendrik Avercamp (1585-1634) who excelled at winter scenes; Cornelis van Poelenberg (1586-1667) who painted Italianate scenes; the naturalist pioneer Esaias van de Velde (1591-1630) and his pupil Jan van Goyen (1596-1656) who produced repetitive views of the Nijmegen River, Dordrecht, sand dunes, and ships; and Salomon van Ruysdael (1600-70) famous for his typical Dutch views and riverscapes. Dutch Baroque realist painters who specialised in other genres included the Haarlem-based architectural painter Pieter Saenredam (1597-1665), the peerless animal painter Paulus Potter (1625-54), and marine artist Willem van de Velde (1633-1707) from Leiden. Works reflecting the Dutch Baroque style of painting can be seen in most of the best art museums in the world, notably the Rijksmuseum Amsterdam and the Mauritshuis Royal Picture Gallery in The Hague. Here is a selected list of the best Dutch Realist artists, together with some of the greatest genre paintings of the century. One of the greatest Dutch portraitists. The Laughing Cavalier (1625) oil on canvas, Wallace Collection, London. Most famous member of the Utrecht School. Adoration of the Shepherds (1622) Wallraf-Richartz Museum, Cologne. Architectural artist famous for his austere whitewashed church interiors. Interior of the Buurkerk, Utrecht (1644) NG London; KAM Fort Worth, Texas. Painter of landscapes and riverscapes. River Landscape near Arnhem (1651) Hermitage Museum, St Petersburg. Genre-painter famous for his tavern genre-pictures. The Bitter Draught (1635) Stadel Art Museum, Frankfurt. World's greatest ever portrait artist; outstanding history painter. The Anatomy Lesson of Doctor Nicolaes Tulp (1632) Mauritshuis. 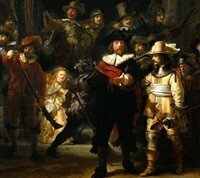 The Nightwatch (1642) oil on canvas, Rijksmuseum, Amsterdam. Bathsheba Holding King David's Letter (1654) oil on canvas, Louvre, Paris. Portrait of Jan Six (1654) oil on canvas, Six Collection, Amsterdam. The Conspiracy of Julius Civilis (1661-2) National Museum, Stockholm. Syndics of the Cloth-Makers Guild (De Staalmeesters) (1662) Rijksmuseum. The Suicide of Lucretia (1666) oil on canvas, Minneapolis Institute of Arts. The Jewish Bride (c.1665-8) Rijksmuseum, Amsterdam. Return of the Prodigal Son (1666-69) Hermitage Museum, St Petersburg. Still life artist, Utrecht/Antwerp School. A Table of Desserts (1640) oil on canvas, Louvre, Paris. Still Life of Fruit (1670) oil on canvas, Ashmolean Museum, Oxford. Painter of peasant scenes, Haarlem school. Rustic Concert (1638) oil on canvas, Prado, Madrid. Interior with Peasants (1663) oil on canvas, Wallace Collection, London. Noted for small-scale guardroom scenes and tavern scenes. Leading exponent of vanitas painting (still lifes with Biblical messages). An Allegory of the Vanities of Human Life (1640) National Gallery, London. Alkmaar architectural painter noted for church interiors with human interest. Interior of the Oude Kerk Amsterdam (1669) Private Collection. Still life artist, noted for pronkstilleven and vanitas paintings. Still Life with Lobster, Drinking Horn & Glasses (1653) National Gallery, London. Still Life with Chinese Porcelain Jar (1662) Gemaldegalerie, SMPK, Berlin. Dordrecht from the North (1650) oil on canvas, Rothschild Collection. River Landscape with Horseman & Peasants (1658) National Gallery, London. Rembrandt's best pupil. Active in Amsterdam and Delft. View of Delft (1652) oil on canvas, National Gallery, London. Leading animalier of the Dutch School. The Bull (1647) oil on canvas, Mauritshuis, The Hague. The Christening Feast (1664) oil on canvas, Wallace Collection, London. Genre painter, noted for interiors with deep linear perspective. The Slippers (1654-60) oil on canvas, Louvre, Paris. View down the Corridor (1662) oil on panel, Dyrham Park, UK. The Mill at Wijk Near Duurstede (1670) oil on canvas, Rijksmuseum. Jewish Cemetery at Ouderkerk (1670) oil on canvas, Alte Meister, Dresden. The Prodigal Son (1640s) oil on canvas, Hermitage Museum, St Petersburg. The Music Lesson (1658) oil on canvas, National Gallery, London. Courtyard of a House in Delft (1658) oil on canvas, National Gallery, London. Interior of Burgomaster's Council Chamber (1661-70) Thyssen-Bornemisza. Leader of Delft school of genre-painting. Soldier and a Laughing Girl (c.1658) oil on canvas, Frick Collection, New York. The Milkmaid (c.1658-1660) oil on canvas, Rijksmuseum, Amsterdam. The Little Street (Street in Delft) (c.1657-1658) Rijksmuseum, Amsterdam. Woman with a Water Jug (c.1664-1665) Metropolitan Museum of Art, NY. The Music Lesson (Lady/Gentleman at the Virginals) (c.1665) Royal Collection. Girl with a Pearl Earring (Head of a Girl with a Turban) (c.1665) Mauritshuis. The Art of Painting: An Allegory (c.1666-1673) Kunsthistorisches Museum. The Lacemaker (c.1669-1670) oil on canvas, Louvre, Paris. Dordrecht School artist, noted for genre paintings of kitchen life, portraits. The Eavesdropper (1657) oil on canvas, Dordrecht Museum, Dordrecht. Last major Dutch landscape painter of the 17th century. A Watermill (1665-8) oil on canvas, Rijksmuseum, Amsterdam. For details of European collections containing works illustrating Dutch Realist genre painting or still lifes, see: Art Museums in Europe.  For more about painting, sculpture, architecture and printmaking, see: Homepage.